Here is another sampling of what we made at my Tart & Tangy Technique Class this past weekend. Not only did we make 3 cards using different techniques but we also made this set of 6 greeting cards with a gift box to hold them. The cards and the box are fairly simple to make. The general idea and the box itself I cased from the very talented Nancy Riley at iSTAMP. She has so many great ideas and samples on her blog. You can view her Tart & Tangy class samples here . She got her idea for this gift set from another very talented demonstrator Jackie Pedro at The Scalloped Edge . You can view her class samples here . She also has wonderful samples on her site. I have both of these very talented ladies listed on my blog list and I visit their sites often. On both Nancy's and Jackie's site they have posted a link to the box directions that were originally from Holly McMillen. I think it is great that talented people are willing to share ideas with one another. I have a couple of other cards to share with you from this Tart & Tangy Technique class but I'll save them for another day. I hope you enjoyed seeing this gift set. 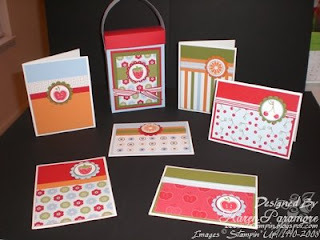 Just think of the nice gift card sets you could make using this idea but changing the stamp sets! The possibilities are endless!